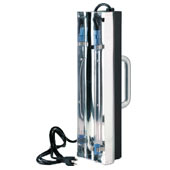 The AAW Handheld UV wand is a portable direct germicidal UV system for surface disinfection with ultraviolet light. It can help control the growth of germs such as viruses, bacteria, mold and mold spores and reduce spreading of infections. AAW Handheld UV wand is designed for applications where a permanent UVC installation is not desired or needed. The UV system can help reduce or eliminate microbial contamination in spaces that do not need constant exposure to UVC light. Common environments include laboratories, hospitals and food plants. The High Output UV lamp emits high intensity UV so the system should be positioned in a way to avoid exposing people to direct or reflected UV light. The UV lamp must be replaced before the end of effective lamp life. Lamps will continue to operate after that but 254nm UV is not emitted. Always unplug the power cord before replacing the lamp. When installing the UV lamp or relamping use cotton gloves or make sure not to touch the lamp. Fingerprints on the glass portion of the germicidal UV lamp will reduce the ultraviolet output.